Extralobar pulmonary sequestration (ELS) represents a mass of pulmonary parenchyma separate from the normal lung. The coexistence of congenital cystic adenomatoid malformation (CCAM) in ELS has been reported. To define this association, the clinical, gross, and histologic features of 50 ELS cases were analyzed. The age at diagnosis varied from birth to 65 years with 24% of cases diagnosed prenatally and 61% (23/38) diagnosed within the first 3 months of life. Fifty-two percent of cases were in females and 48% in males. Forty-eight percent of ELS(s) were located in the left hemithorax, 20% in the right hemithorax, 8% in the anterior mediastinum, 6% in the posterior mediastinum, and 18% beneath the diaphragm. The blood supply to the sequestration in 77% of cases was directly from the aorta. Grossly, the lung, though hypoplastic in some cases, was otherwise unremarkable. Fifty percent (23/46) of ELS cases were associated with a coexistent CCAM. In contrast to the series as a whole, 92% (11/12) of the ELS/CCAM cases, excluding those prenatally diagnosed, were diagnosed within the first 3 months and 57% occurred in females. ELS/CCAM lesions, while randomly distributed, were more frequently seen on the left side. Gross features of the ELS/CCAM cases were similar to those cases with ELS alone. 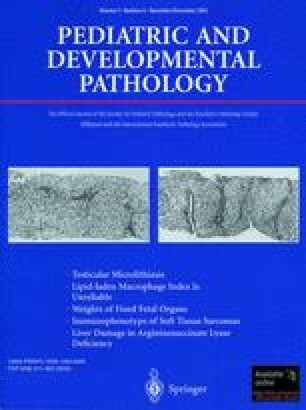 All CCAM cases had a type 2 pattern on histologic examination with 48% of those cases also displaying rhabdomyomatous dysgenesis. Our findings indicate that the occurrence of CCAM in ELS is more frequent than reported in the literature and differs in presentation from ELS cases not associated with CCAM.